Wait, What’s an SSL Certificate? A Secured Socket Layer (SSL certificate) is a cryptographic protocol that allows for a private channel of communication between a webserver and a browser. Google’s opinion matters and they want you to get an SSL certificate. Since Google is sending a majority of search traffic your way, it is a necessary cost of doing business. Furthermore, Google will start to downgrade your search ranking results if you do not own an SSL certificate. With the safety initiative intended to protect its users, Google is attempting to protect its customers, not penalize you. Therefore, even if your site does not have an ugly warning right now, it will in a few months. In light of all data breach stories making headlines, you want your customers to be confident with your business. 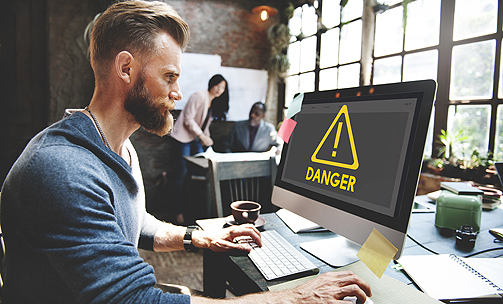 Like it or not, these warnings will affect user experience on your website. Nobody wants to be told they are going to a potentially harmful website. 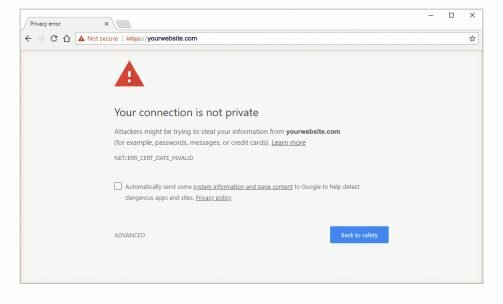 Many tech-savvy customers already have negative feelings about using sites without SSL certificates. These discerning clients view it as the site is not being kept up to date and maintained like ones that do have SSL certificates. By purchasing an SSL certificate and integrating it into your website, you are making transactions safer. In fact, it ensures data gets encrypted before being sent out, making it harder for hackers to steal. This is particularly important when sharing sensitive data such as credit card numbers during online purchasing. However, this is not restricted to ecommerce or banks. Any website that shares any personal data (such as filling in a contact form) should do it securely. That’s the whole reason Google rolled out the warning on sites with forms. Finally, even sites without ecommerce or forms, should buy and integrate an SSL certificate. Why? It decreases the chance of content rejection and helps you avoid third-party attacks. What is a third-party attack? It’s when two parties think they’re communicating with each other, but a third person is eavesdropping on these communications and changing them to steal information or money. It can be very harmful. Another added bonus is that securing your site gives access to HTTP/2, a major enhancement of the protocol used to transmit data. A huge benefit of HTTP/2 is that it’s faster, since it was designed to prevent latency to speed up page loads. Since page load speed is a major factor in search engine optimization, switching to HTTPS (and HTTP/2) can improve your search engine rankings. WebDesign309 wants your website to be secure and knows integrating SSLs into your site can be a pain. For that reason, we are offering a convenient one-stop shopping for SSL certificate purchase and integration.Let our team ensure your site is secured correctly to avoid the hassle of your site being flagged. Did you know WebDesign309 also offers hosting services to our clients that can help to correct any technical problems? It’s just one more reason we provide the best website design Peoria IL businesses can buy. Call us today from Peoria or Bloomington at 309-213-9398 or contact us online for SSL certificate service, web hosting, web design or anything else you need. Not in Peoria or Bloomington? Schaumburg, Naperville and Chicago clients call 847-906-2287. Springfield and Decatur clients call 217-408-2813. LaSalle-Peru area clients call 815-220-5945. Quad Cities clients call 563-258-7770. Indianapolis customers call 317-483-0117. Clients in Key West can dial 305-204-7320. And welcome clients of our newest office in Grand Rapids! You can call 616-931-5009.